Linda Medley was born in Stockton, California and now lives in Portland, Oregon. Before embarking on Castle Waiting, Medley worked in the comics industry as a penciller, inker, painter, colorist, and sculptor. 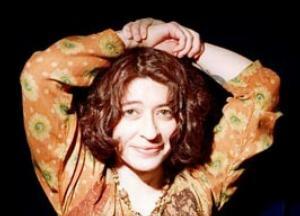 Her pencilling work includes stints on DC Comics’ Justice League America (1991) and Doom Patrol (1993), as well as the Galactic Girl Guides for Tundra Press. As a colorist, Medley worked for Image Comics in 1994–1995, most consistently on Deathblow. She colored DC’s Batman and Robin Adventures for two years spanning 1995–1997. A freelance illustrator since 1985, Medley has illustrated children’s books for Putnam, Grosset & Dunlap, Houghton-Mifflin, and Western Publishing. Her paintings have appeared on the covers of Paradox Press’s Family Man, Howard Cruse’s Stuck Rubber Baby, and TSR, Inc.’s Dragon magazine, to name just a few. Medley was a 1996 Xeric Award recipient. In 1996, she was an Ignatz Award nominee for Outstanding Anthology or Collection. In 1996, she was an Eisner Award nominee for Best Writer/Artist; and in 1998, she won two Eisner Awards, for Best Ongoing Story (Castle Waiting) and for Talent Deserving of Wider Recognition. Also in 1998, Medley was a Lulu Award nominee for Lulu of the Year. 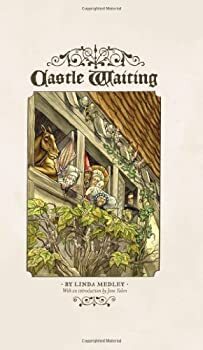 I picked up Castle Waiting by Linda Medley at the recommendation of The Book Smugglers who described a charming take on classic fairy tales with a twist. When I checked it out from the library, it felt like a vintage volume of fairy tales with a beautiful full-color illustrated cover, rough cut pages, and a silk ribbon bookmark. However, there is a very modern sensibility to these stories. Castle Waiting is a hardback omnibus collection of the first several issues of Medley's comics about an abandoned castle that has become a refuge for the abandoned, lost, and rejected in society.